There is a movement building in Detroit, slowly building in power and purpose as it meanders through the streets of the city. It is not a protest or a new political party, it is not a tax break or a reality TV show, it is a bike ride. And though it has no manifesto, its purpose is clear: to bring people together through good old-fashioned fun. 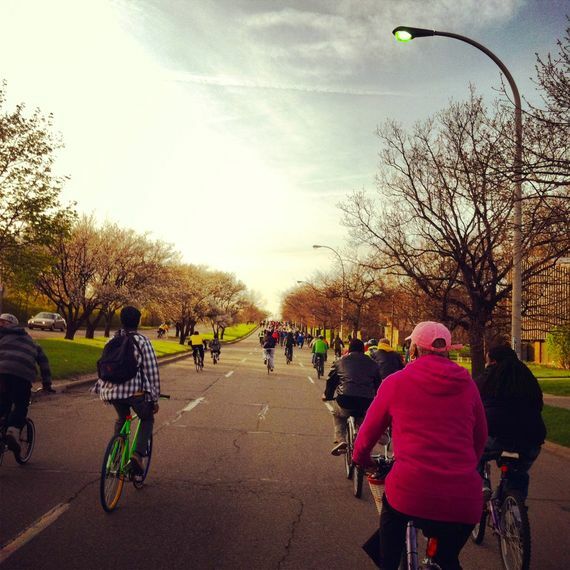 Slow Roll is Detroit’s Monday night group bike ride in which thousands of pedalstrians come together to explore the city on a free bike ride. Throughout the route, riders share space with one another, explore new neighborhoods, and deepen their relationship with the city. Riding in Slow Roll is like swimming in a massive school of fish. You are an individual but you are not. Your pace is not your own. You relinquish control to the group — everyone is going the same way and there’s nothing to be gained by getting there first. The group flows in a stream up to 3 miles long. Along the way, stunt bikers and skateboarders jump curbs and ride railings like dolphins playing along with thousands of salmon on a whimsical migration. 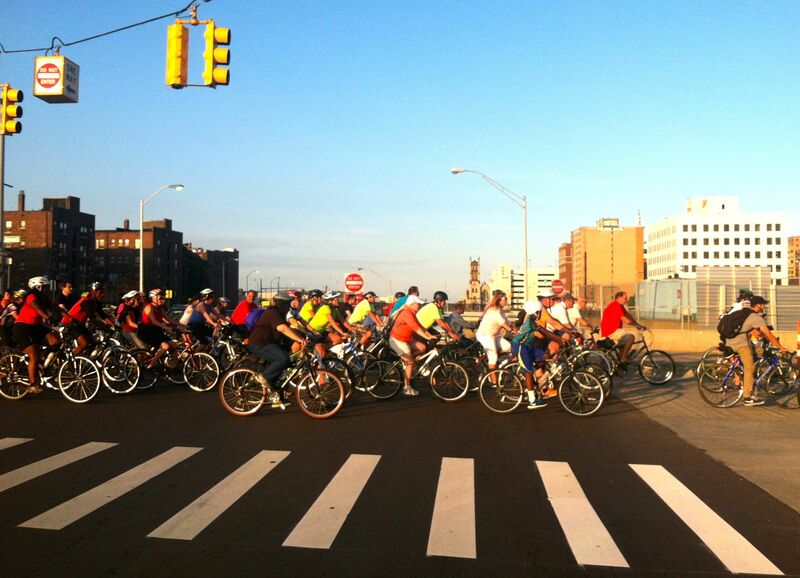 Before each weekly event, riders gather at a predetermined location near downtown Detroit. The ride starts in a series of laborious stuttering bursts as the group works to harness their collective momentum. Before too long, a more seamless quality prevails as riders roll from dense urban areas to scattered outskirts. Most rides have a special destination — The Heidelberg Project, Fort Wayne, the Packard Plant — giving participants a chance to become acquainted with a noteworthy part of the city. The real substance, however, is the interaction with people and places along the way. Residents along the route sit out on porches and line sidewalks to wave and snap pictures, surprised to see such a powerful showing of vitality in places more often characterized by loss than gain. Even for riders who are familiar with the city, biking (and biking slowly) offer an intimacy that is often lost in cars or on highways. The ride is self-policed. Teams of yellow-shirted volunteer organizers block off impatient drivers at intersections and ride alongside bikers shouting “stay RIGHT!” when, inevitably, the group swells beyond its boundaries. Members of the “Squad” carry emergency repair kits to repair flats when a biker hits a pothole too hard or snags some errant street shrapnel. The riders all play a role too: calling out “hole!” to warn others of the [innumerable] divots, and speaking the language of communal to indicate turns and stops. Slow Roll is now too big to escape scrutiny and there are legitimate concerns of what it’s all about. Is this some sort of gentrification ritual? Slow Roll’s very newness seems to suggest that the answer is “yes,” not to mention the youth and money positive publish attention. But the ride is so utterly inclusive and affordable [free] that you may start to question that judgment. Ultimately the ride is about observation and interaction. It is not about gentrification. In fact it is the antidote. Riders come in all types. They are mostly Detroiters, but there are some suburbanites and tourists. They are mostly adults, but it’s increasingly common to see kids, infants and even small pets along for the ride. They are mostly bikers, but they come on a variety of rolling devices from unicycles to futuristic mini-segways. They are neither mostly white or mostly black in an almost unheard of representation of balance within this often divided city. They are, without exception, warm and joyful and happy to be there. Is it overly obtrusive to cars? There’s no question Slow Roll is a nuisance to drivers caught in its mighty wake though it minimizes conflict by leaving an open lane and managing intersections with volunteer “Corkers.” The routes tend to favor low-traffic streets, of which there are many since the city and its streets were designed to serve a much higher population that it currently sustains. 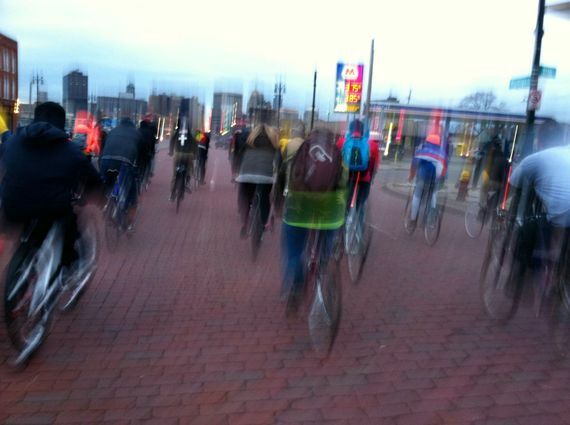 Bikes have as much a right to the road as other the others, whether the Motor City is used to accepting it or not. The real question is not if it inconveniences cars, which it does, but if it’s worth it, which it is. There may come a time when volume of bikers exceeds the city’s patience for hoards of happy people and Slow Roll may be at the upper limit. But it is not inevitable. In nearby Ann Arbor, over 110,000 sports fans pour into Michigan Stadium on a regular basis to cheer and drink maybe watch football. Roads shut down, traffic slows to a crawl, public intoxication is rampant, and police come out in force. Over a century, the city has learned to accommodate the flash flood of fans because they generally recognize that it brings more than it takes away. It is within Detroit’s capacity to do the same. Slow Roll has changed dramatically from a small intimate ride between a few friends to a huge civilian’s parade, The event now has corporate sponsors and was recently featured in a popular iPad commercial. High-tech drone cameras and wheeled robots sometimes follow the ride gathering footage. These may be harbingers of a different sort of event. But it’s refreshing to see success come to something so deserving and the organizers should be compensated for creating their own jobs in a city with so few to spare. There will always be those who dismiss Slow Roll as a parade of ruin, a public nuisance or commercialism in disguise. But to vilify Slow Roll is to utterly miss the point. For all its minor transgressions, it is an overwhelmingly positive thing, a beautiful community event, an emblem of What is Good in Detroit. Slow Roll is effective because it isn’t borne out of anger, but out of a sincere desire for some wholesome enjoyment. It is a movement based on movement, activism based on activity. It taps into Detroiter’s deep longing to be proud of their city, and who don’t want to be afraid anymore. If you’re lucky, you’ll come on a week where the route passes through a tunnel or below an overpass. For a few magical moments, the entire crowd spontaneously erupts into howls, squeals and ringing bells until the echoing noises merge together into a single chorus of joy. This article was published in The Huffington Post here. This entry was posted in Detroit, Non-Fiction, Published and tagged Biking, Detroit, detroitbikecity, slowroll. Bookmark the permalink.